Always fancied a bit of adventure and mystery? Perhaps a secretive profession that allows you to travel all over the world and carry a license to kill? 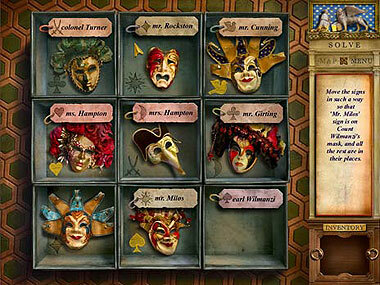 Well, long before the existence of 007, there was Mr. Cunning, the star of the exciting hidden object game – It’s All About Masks. A British Secret Agent who protected his country in the 19th century, some even say that Mr. Cunning was the best his country has ever seen! The year is 1874 and your new assignment is to accompany Teodor Milos to Venice with some very important and secretive documents. The only problem is that Mr. Milos appears to be slightly on the shady side and in fact, shouldn’t be let out of your sight or trusted with these documents at all. Should these documents go missing, Mr. Milos may very well be branded as a traitor and you may be requested to execute him immediately! 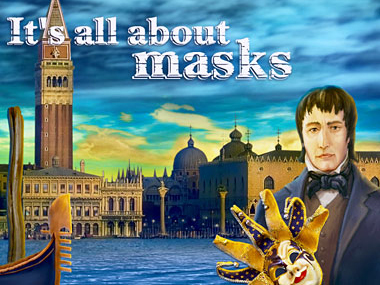 It’s All About Masks starts when you board the Victoria Yacht to Venice with Mr. Milos. But, as expected, within a few days the documents indeed go missing. Now begins your quest to find out who stole the documents and attempt to get them back. You start this hidden object game by searching each of the yacht’s rooms and the occupants’ quarters. Predictably, these slightly eccentric characters are glad to point a blaming finger in each other’s direction, which means that you end up searching each and every room on board. 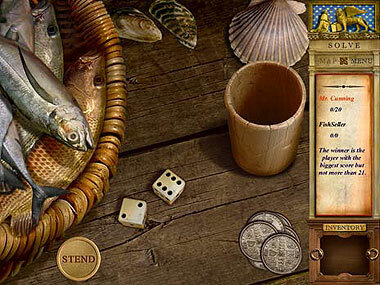 The game is divided into two types of scenes: hidden object games and mini-games. 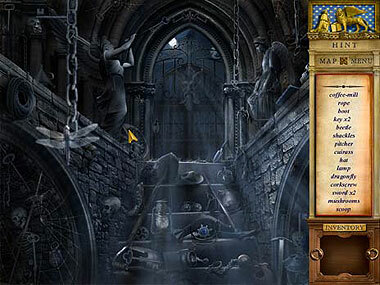 The hidden object scenes are completely random (with the added value of being able to play this game again and come across different objects to find), except for inventory items, which you need to collect and use later on in the game. The visuals in the game are bright and colorful with great attention to detail, although sometimes this results in the hidden objects being difficult to find or rather small. Luckily there is a “Hint” button that points you in the right direction. Perhaps more hints would have been handy in this game, but having said that, the hint button does re-charge every few minutes. The mini-games are good fun and completely different for every scene. They vary from sewing a jigsaw by re-assembling pieces of a rose to rotating ancient plates in order to create a password and open a casket. Some mini-games can be skipped but others, like matching name tags to masks, are vital for the game and you must complete them in order to move on. So, now the question is: Will you be able to recover these top-secret and important documents before you arrive in Venice? Play It’s All About Masks now and see if you’re up to the challenge! Download and play It’s All About Masks for FREE! CAN YOU PLEASE STOP HAVING YOUR SITE COME UP AS POPUP!!!!!!!!!!! THIS IS SO IRRITATING HAVING IT KEEP COMING UP WHEN I AM ON MY EMAIL OR OTHER PROGRAMS! THANK YOU!! me gustan los juegos de objetos ocultos, me hacen pensar, y además es un reto para mi, ya que no se mucho el idioma del inglés. gracias. I would like to play your games and play this game but it would let me it says that it is dangerouess to my computer and some of your other games say it too . And it upsets me because I love to play mystery seek and find . In Samantha Swift I got to one place where it said use tools but the game had taken them away from me and I could go no further. I did not get to play Hidden Roses of Athena very long it shut down. The games last a long long time and sometimes I am not able to play them that long. Which causes me not to be able to come back to them. I know if I bought them I could but I don’t want to play them more than once. I love playing your game but lately you have been having advertising above the game have been inter-fering in the games and if it is doing it to me it doing to other people also. hope this can be corrected. 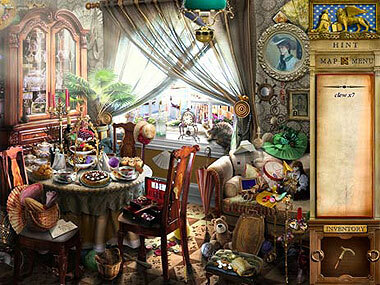 I enjoy the hidden object games. It keeps the mind thinking and helps the memory. I have shared your site on FaceBook, but I and my friends cannot get them to download. We click on where it says to download, but the box that is supposed to come up so we can click on “run” doesn’t come up at all. I have tried many times. What can we do about this so all of us on FaceBook can play your games? bonjour je suis une abonner de votre site,si-il vous plait je demande tout les jeux de restauration parmi c’est jeux,DELICIOUS-EMILY’S HOLIDAY SEAS et DELICIOUS:EMILY’S TASTE OF FAME,svp je ve les jouez gratuitement merci de votre attantoin. I’m hoping to have good experances with these games!! My name is Sarah, and work for UKpositions. In my capacity as an SEO Manager, I manage a list of excellent sites that focus on the same niche as freeridegamesblog.com. As you know, exchanging links can help improve PageRank, visibility, and increase traffic to both our sites, and most important – put us above our competitors. If you are interested, just reply to my email and I will send you a few examples for you to choose from. Also, If you can send me your Skype or any other IM, we can work this out much faster.